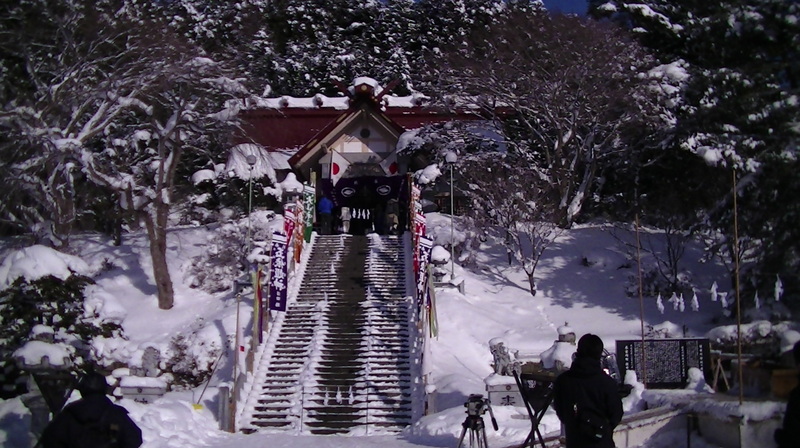 The Kikonai misogi is performed in January at Samegawa Shrine (佐女川神社), a relatively small shrine that is picturesquely nestled on the side of a mountain. 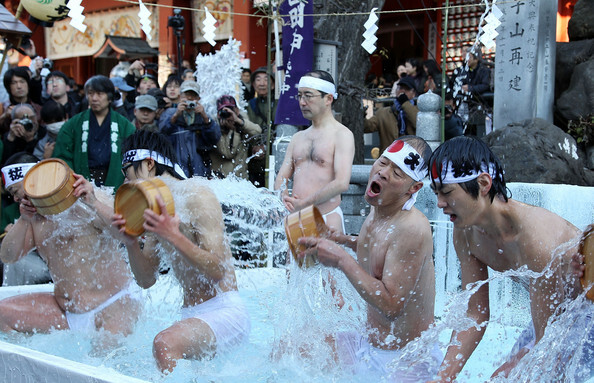 The misogi itself is quite well-known in Japan due to its extremity and involves a group of four young men (in their late teens to early 20s) stripping down to a traditional Japanese loincloth (fundoshi), in temperatures of up to -15 degrees, and then being repeatedly splashed with ice-cold water in a ritual performance that lasts about 30 minutes. The performance itself is then repeated by the same young men, every 2-3 hours, over the course of 2 days and culminates in a procession, where they carry statues of Shinto deities (kami) down from the shrine and into the sea to be ‘cleansed’. Participating in the event as one of the main performers involves a commitment to continue for four consecutive years; a commitment I was repeatedly informed has never been broken since the misogi was first performed at the shrine, over a hundred years ago. In terms of the actual ritual performance; the men accompanied by the sounds of rhythmic drumming, march in single file to a small raised stage of straw where they then take turns to kneel while the most senior member of the group splashes them from behind with buckets of ice-cold water. This procedure is repeated for each participant a total of three times, which means that after enduring their splashing, each recipient then needs to stand and wait for the other three to complete their turns (without shivering) before kneeling again to receive the next round of cold water. After an entire session is complete the men then march in single file back to the main shrine hall, located up a steep flight of stairs about 20 meters away (where they will also sleep during the two days of the festival). There they wait and warm up for around 2-3 hours before the drums began again and they file out for their next session. My participation in the misogi at Kikonai was unexpected and was arranged due to a spontaneous offer by a local organiser (and previous participant). Taking part for me involved performing a single 20-30 minute session along with another Japanese researcher I was travelling with and an anthropology undergraduate from a nearby university. I was informed that such impromptu sessions were occasionally performed and that there were even ‘old man challenges’ in which elderly members of the community would sometimes perform sessions late at night. Our particular session took place at around 10pm, after the shrine was deserted by all but a few committed camera men. Mentally I found the experience quite daunting, as earlier that day, while watching the misogi performers along with the festival crowds, I had found myself shivering badly despite being bundled up in layers of warm winter clothes. As such, the thought of stripping down to almost nothing in the same environment and then being splashed with ice-cold water was not entirely appealing. However, since I had agreed to take part and recognised what a rare opportunity it was (I would be the first foreigner to take part), I did my best to ignore my hesitations and before too long I found myself kneeling semi-naked, amongst the falling snow, on top of the straw stage I had been watching earlier, awaiting the first bucket of water to arrive. Before leaving the shrine building I had been given some last-minute advice by some locals and previous participants. In particular, I was told to keep my hands folded tightly against my armpits -to prevent excessive heat loss- and to make sure my arms were folded high on my chest -to prevent a heart attack from shock(!). I’m not sure how realistic the second warning was but it certainly succeeded in making me care about the position of my arms. I was also told to breathe slowly and make sure not to visibly shiver as this was not permitted. I remember thinking internally that not shivering would be impossible and wondering how it would look if I had to quit in the middle of the performance but then the drums started and off we went. Stepping out of the shrine into the winter air was a shock but I remember feeling glad that my feet weren’t as cold as I had imagined and being preoccupied with trying to keep pace with the rest of the group and making sure I didn’t slip and fall down the steep concrete steps. Once on the stage, our feet were splashed with cold water and then in short order, I was invited to kneel down to be the first recipient of the cold water. After some repositioning and further explanations, I found myself staring out at the small crowd in front of the stage, arms folded tightly, while my heart raced and I awaited the first splash to hit my back. When it eventually came I found that my mind was so preoccupied with attempting to perform the ritual correctly that I largely ignored the sensation, to the extent that I even forgot to shout the necessary response of OSSSU and had to be reminded by the experienced performer who was guiding us through the process. For the subsequent splashing, I responded correctly but still found that my mind was intent on avoiding paying much attention to the shocking sensation of the water and instead, was variously flitting between focusing on the ritual procedure, dredging up memories of painful training sessions in Judo & Brazilian Jiu Jitsu (I think because these are the only other occasions in which I had yelled OSSSU) and manifesting images of my family. Another point worth mentioning is that when the air temperature is -15, water — even when it is nearly freezing — does not feel as cold as it does when you encounter it at room temperature. The water was physically shocking but relatively speaking it wasn’t so bad; the worst part was actually after the splashing finished and I was required to stand without shivering. This took severe effort and it seemed that as soon as I got my knees under control, my teeth would start chattering. My third and final session of splashing finished with the experienced performer slowly tipping the bucket of water, so a small but constant trickle of water poured onto the crown of my head. This was much worse than the splashing but I still remember feeling a certain sense of sadness that it signalled the end of the session was approaching. Although, admittedly it’s easier to have such thoughts when you know the end is approaching. Back at the shrine, as we sat warming ourselves and getting changed around a stove, I was asked how I had found the experience. After communicating that it was very hard but maybe not as bad as my imagination had made it seem, one of the four main performers from that year explained that for them the individual performances were also usually quite bearable but that the real difficulty was dealing with the constant awareness that in a few hours the ordeal would begin again. This struck a chord with me, as I realised that I had constantly been able to remind myself during my experience that it would be over soon and that I just needed to endure for a bit longer. For the main performers this kind of consolation is obviously not available and I could appreciate that this would make things much more mentally, if not physically, punishing. This might also account for why the newest of the four performers looked quite forlorn in-between performances; this was his first year and he had at least another three years of performances to go. I remain in awe of the determination and stoic attitude of the main performers, especially when, speaking to them informally after the event ended, they all presented their participation in good humour and claimed that they were not especially hardy individuals but rather had made a commitment and would thus have to see it through. There is some typical Japanese self-deprecation in such statements but, at the same time, I don’t doubt that a sense of obligation to the community of Kikonai is part of what drives these young men to endure such a harsh ritual each year. What makes this more remarkable, at least to Western audiences, is when one considers that religious devotion was never invoked by any of the performers, even as a small part of their motivation. Religion in Japan is a slippery subject that would need a series of posts to discuss (see here and here for some of my previous attempts) but the fundamental dichotomy is that participation in religious rituals and ceremonies is high, while overt belief or devotion to specific religious beliefs or doctrines is very low (in fact Japan is often ranked as the least religious country by this measure). Indeed, for me the existence of these kind of extreme rituals in the absence of deep religious devotion is part of what makes Japan such an interesting environment to conduct research on rituals. I will repost my Kanji thoughts here — not sure where most dialogue will take place. Jisho & Tangorin dictionaries shows that top-left as GROUND + KETTLE LID. OR, could it be HAND or HAIR? So, did it use to involve some animal sacrifice that later became an austerity ritual aimed at similar purification. Probably no way to know of course, but if someone did, thought it may be you. But this harau means: to exorcise, to cleanse, to purify. Which are clearly related. I loved that. But back to the character: I could see a HAND, waving a LARGE sword in a purifying ceremony. Was a sword used in the ceremony? My memories were that “misogi” only described these water rituals, but are any other purification rituals called “misogi”? Perhaps the story of Izanagi’s purification tells of this, in the Kojiki. Curious to see? I found out about that here. The bizarre, morbid births of the Japanese Shinto gods via Izanagi makes the Bible stories look tame. For curious readers, see this wiki article. But I see no mention of a sword in the purification ritual here. 喫 from the note on Yomotsu Hegui. Note, the right hand side is the same. Kun yomi is nomu (like smoke tobacco or inhale) and kun is Kitsu — so don’t know where “gui” comes from. Most of these seem like some sort of ateji without symbolic meaning. But it didn’t tell me anything about 喫.
Yeah I’ll continue to cross-post my stuff here, occasionally with extra images because I don’t mind clutter, as well as occasionally posting things that are not relevant to GoR. So hopefully there will still be reasons to visit. In regards the kanji discussion, I am certainly no expert on classical kanji but I do know some people who might be able to provide a more satisfying answer so let me get back to you. I think though that while misogi in the modern era almost always refers to purification involving water, this was not originally the case. Will update after I get better info! a) The three characters on the right constitute a common component meaning oath, pledge, bond, contract, etc. As such, it is quite possible that their individual meaning has no specific relevance to misogi practices. However, there are some ways to interpret the 契 component that relate to cutting off/removing impurity. b) The origin story for misogi practices is traced to the Kojiki story that Sabio mentions (and indeed, the shrine priest recounted that very story to me very recently). However, it is not entirely clear if 禊 always primarily referred to water purification rituals or whether it was an existing term applied to other ritual purification practices prior to the Kojiki and only became specifically associated with such practices over time. c) The character on the left (as Sabio probably knows) is also part of an older version of the kanji for god(s) (Kami) and thus the word carries the implication of contact with the gods/divinity, although that can also often be interpreted simply as meaning ritual/ceremony. Chris, here I illustrated the components of the character we discussed above. Hi Chris, fascinating account, you’re made of sturdier stuff than I, h/t 🙂 and interesting observations. How would you compare this to the New Year Polar Bear Dip that is common in parts of Canada and the United States ? The statement ” they all presented their participation in good humour and claimed that they were not especially hardy individuals but rather had made a commitment and would thus have to see it through”, reminded me of this; especially those who do participate in the Dip for charities or community fund raisers. elemdiat> I see some parallels with misogi practices generally but the level of commitment and the severity of the ordeal involved in the particular case I discuss above I think reduces the similarities. If you look at people completing Tough Mudder or a Polar Dip, although there is a definite struggle involved, there is also plenty of room for self expression and fun. That might be the atmosphere of the surrounding events at the misogi in Kikonai but for the performers there is no self expression or play during their performances. The only exception is at the very end of the ceremony when they enter the sea and are able to ‘frolic’ before returning for a final cold water splashing session. The light hearted attitude and humble attitude of the performers is only really evident in-between (or at the end of all) performances. I did actually in a previous piece about the bonding effects of pain make reference to Tough Mudder though, so I don’t think you are far of the mark with such comparisons more generally speaking.